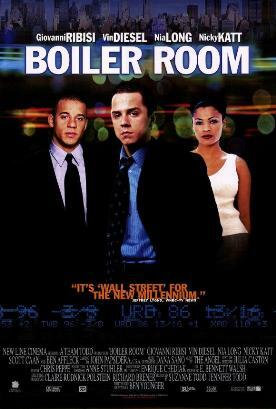 One must naturally applaud the highly moral purpose of a movie like Boiler Room, written and directed by Ben Younger. Out of appreciation for it, one can almost ignore the rap music and the suffocating hipness and, with them, the suspicion that like its model, Wall Street, the film really glorifies what it ostensibly disapproves of, which is the get-rich-quick culture of New York stockbrokers. There is a scene here in which all the big shot brokers at the J.T. Marlin brokerage shop sit around watching a video of Wall Street and speaking the dialogue from memory. Such favorite lines as “Greed is good” and “Lunch is for wimps” live again as an ideal but Ben Younger hasn't quite got the chutzpah of Oliver Stone. In the end, he retreats to an unconvincing, feel-good ending. Well, if you swallow that, you might as well swallow the rest, up to and including the final, voiceover epiphany: “I tried slinging crack, and I never had a jump shot. Now I've got to get a job.” And to help the bolus go down, we have the affecting story of a reconciliation between father and son, estranged since Seth, aged ten, fell off his bicycle and his father expressed his concern for him and any possible injuries he might have sustained by slapping him across the face. “All I wanted to do was make your pain disappear,” dad explains twenty years later. “Not a single day of my life has gone by that I don't think about that moment”—which makes you wonder why he never said anything about it before. But all's well that ends well, and dad's high expectations of his son seem finally to have eventuated in a search, or a prospective search, for a legitimate job. And so on, and so forth. I guess that, like Notorious B.I.G. 's inspirational rap chants, this is supposed to seem cool and seductive, but you can't help coming away feeling that anyone who, like Seth, falls for such stupidity and moral illiteracy deserves—well, rather more than he gets.